A fishermen didn't let winter weather get in his way from casting a line recently near the Stevensville bridge. Years ago, when my boys and I decided to learn how to fly fish there weren’t a lot of books of instruction about what we should and should not know about fly fishing. The only fly shop that I remember in our area went out of business and it was tough finding out about casting and other techniques. A friend of ours who was an avid fly fisherman was very encouraging and was a big help in getting started purchasing some fly rods, etc. Unfortunately, our friend lived 300 miles away and was of no help giving instruction. Most fly fishermen that I know either have a copy of the book or have read it. Sheridan Anderson who also illustrated his own book wrote the Curtis Creek Manifesto in 1978. I have referred to it at least 100 times over the years and recommended it to people who are interested in learn to fly fish but wanted to learn about it before purchasing the necessary equipment and launching into the sport. A few weeks ago I volunteered to take two individuals to the Bitterroot in an attempt to teach them a little about fly fishing. It makes sense to me to begin by giving each of them a copy of this fun little book and waiting to see what they say about the book before we begin. 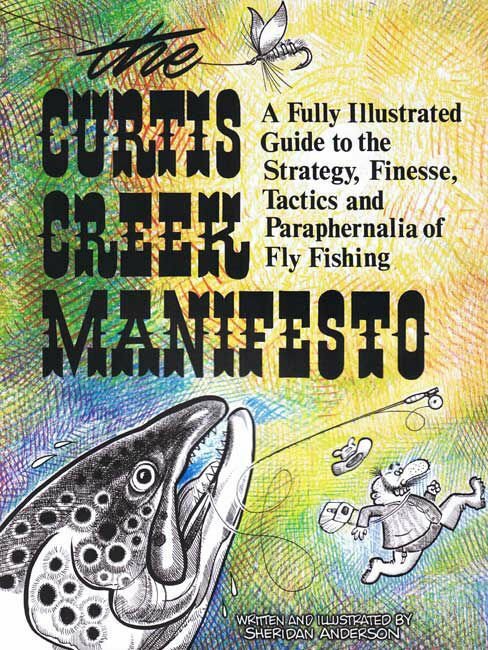 I believe reading the book is a precursor to anyone who is interested in learning how to fly fish. The Fly Fishers of the Bitterroot had a great presentation by Bob Prince last Tuesday evening. The presentation was an accumulation of fly fishing pictures from 2018 provided by club members and others. If you are interested in being a club member please come to the next meeting on the second Tuesday of March at BJ’s Restaurant. Dinner is at 5:30 p.m. and the meeting gets started at 6:30 p.m.
You might get lucky and win the door prize or some of the fine things that are donated to the club including skwala fly patterns as well as others. It doesn’t feel like fly fishing time with the latest cold weather and snow snap but it is just around the corner and in about three weeks we will be on the Bitterroot casting our Skwala imitations to hungry fish. Bitterroot Trout Unlimited will be meeting Thursday, Feb, 21. at the Hamilton Elks Lodge. Crissy Oschelle from Montana Fish Wildlife and Parks is talking about the upper Bitterroot Recreation Plan that has been in existence for about one year. This is a good time to ask Crissy some questions about the changes that have taken place and what plans MFWP might have in the future.